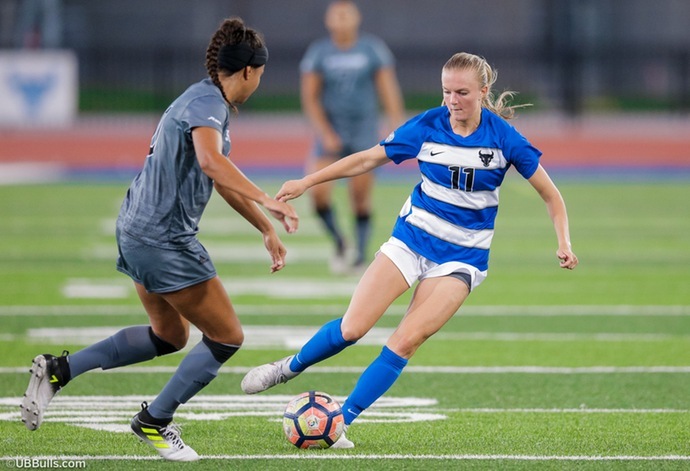 BUFFALO, N.Y. -- After opening up Mid-American Conference play last weekend on the road, the University at Buffalo women's soccer team (7-2-0, 1-1-0 MAC) will return to UB Stadium this weekend for a pair of challenging conference matches. The Bulls will welcome the Central Michigan Chippewas on Friday night at 7:00 pm before closing out the weekend with a matchup against Eastern Michigan on Sunday at 12:00 pm. Buffalo is coming off of their MAC opening weekend in which they went 1-1 as they took down Northern Illinois on Friday night before falling to Western Michigan on Sunday afternoon. The loss on Sunday halted the Bulls seven-match winning streak, the second longest winning streak in school history and the longest winning streak for games decided in regulation in school history. The Bulls opened the weekend with a commanding 5-0 victory over the Huskies as they were able to score all five goals, a season-high, in the second half including three goals within 53 seconds of one another. The three goal spurt in 53 seconds was the second fastest in NCAA history, falling two seconds shy of the NCAA record of 51 seconds held by Notre Dame. The Bulls received goals from Carissima Cutrona, Kaitlyn Walsh, Marcy Barberic, Carley Zoccali and Tess Ford while Gurjeena Jandu added a career-high three assists and Rebecca Brambleadded a career-best two helpers in the dominant win. On Sunday against a very talented Western Michigan side, the Bulls were able to dig themselves out of a 4-0 hole as they were handed their first loss since the opening match of the season against St. John's. The Broncos were able to earn a pair of penalty kick goals in the second half to put the game away but the Bulls fought hard and netted a pair of goals, one by Andrea Judasz and the other by Gurjeena Jandu, to make the score respectable. On the year, Cutrona is leading the Bulls impressive offensive attack as she has racked up six goals, seven assists and 19 points while taking 24 shots. Cutrona's running mate, Marcy Barberic has also had an impressive start to her sophomore campaign as she has notched five goals, four assists and 14 points while defender Gurjeena Jandu has added a career-high two goals and five assists on the offensive end of the field. Kaitlyn Walsh has been great when in the lineup as she has three goals, two assists and eight points in six matches this season. Freshman Tess Ford currently ranks third on the squad with three goals and seven points, all of which coming off of corner kicks. Defensively the Bulls have been solid all year long aside from last game against the Broncos as freshman goalkeeper Emily Kelly owns a 7-2-0 record to go along with a 1.02 goals-against average, a .809 save percentage and four shutouts while making 38 saves on the season. Jandu and Ford have been strong in front of Kelly while Rebecca Bramble and Adrianna VanCuyck have played key roles in the Bulls early success. Freshman twins Hannah Callaghan and Abbey Callaghan have also played major minutes for the UB defense this season and have continued to improve and develop into key components for the stingy Bulls defensive unit. Central Michigan enters Friday's match with a 4-6-0 overall record but opened MAC play with a pair of victories last weekend as they took down Ohio, 1-0, in double overtime on Friday before handing Kent State the 2-1 defeat on Sunday at home. Leading the Chippewas offensive attack is Lexi Pelafas who has netted six goals, three assists and 15 points while notching 41 shots on the year. Shannon Magnan is enjoying a nice start to her season as she has chipped in with three goals and five assists while Madison Costner has netted three goals and two assists and 18 shots for the Chippewas. The Chippewas have used a pair of goalkeepers so far this season as Brianna Wallbridge took over the starting spot four matches ago. Wallbridge started both matches last weekend and owns a 3-2-0 overall record to go along with a 0.94 goals-against average, a .615 save percentage and two clean sheets. Morgan Britian opened up the season as the starting keeper and owns a 1-4-0 overall record with a 2.60 goals-against average. Eastern Michigan currently owns a 6-5-0 overall record and a 1-1 MAC mark after downing Kent State 2-0 and falling to Ohio 2-1 during opening weekend for conference place. The Eagles are led offensively by Kristin Nason who has notched five goals on 33 shots this season while Sabrina McNeill is enjoying a nice start with three goals, three assists and nine points to go along with 44 shots. In goal, the Eagles are anchored by senior Kaylin Williams who has made 10 starts this season and owns a 6-5-0 record to go along with a 1.48 goals-against average, a .779 save percentage and two shutouts. She had made 53 saves so far this season including seven in the Eagles 2-0 win over Kent State to open MAC play. After this weekend, UB will hit the road for a single match on Thursday night as they head to Kent, OH to take on the Kent State Golden Flashes at 7:00 pm. UB will then return home on Sunday for a showdown with Ohio at 12:00 pm inside UB Stadium.